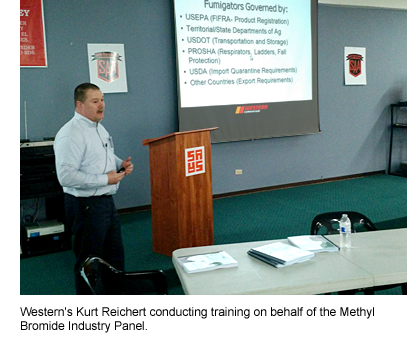 During the week of December 7th, NPMA (National Pest Management Association) and ASPCRO (Association of Structural Pest Control Regulatory Officials) co-presented Structural Fumigation Safety and Compliance Workshops in San Juan, Puerto Rico and St.Croix, USVI with a live, interactive web simulcast shared with applicators in St. Thomas. The program attracted more than 75 certified applicators that actively use structural fumigants in the region. The two workshops (each a day-and-half long) provided fumigators with more than 12 hours of refresher training focusing on topics including the review of the methyl bromide, sulfuryl fluoride and metal phosphide labels, hands-on label interpretation exercises, basic pest identification and biology reviews, personal protective equipment, IPM and alternatives to fumigation, safety considerations in the “real world", as well as federal and local fumigation regulatory requirements. The workshops were the culmination of months of planning and collaboration between NPMA, ASPCRO, EPA Region 2 representatives, fumigant registrants and distributors, the Puerto Rico Pest Control Association, the Puerto Rico Department of Agriculture, the USVI Department of Planning and Natural Resources and the University of the Virgin Islands. Sponsorship and technical expertise was provided by Degesch America, Douglas Products, the Methyl Bromide Industry Panel and Superior Angran. NPMA is committed to contributing to the training and professional development of its members and will continue to look for opportunities to provide fumigation education opportunities in the future.